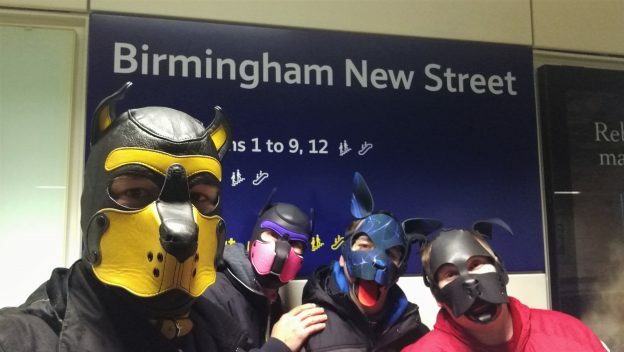 With Scritches being a monthly event held in Birmingham, it gives some opportunity for some midlands pupping if we make the pilgrimage to Brum. While a plan to get to the station before Scritches started was almost formed, the fact Echo, Sparky, and I were running late put paid to them. So we joined with Halvor once again to get another group shot. Birmingham New Street is a Network Rail station, and not owned by any franchised railway company. This means that there is a lack of dedicated station name signs everywhere except the ends of the platforms. These signs turned out to be illuminated, and in the late afternoon on a miserable Saturday, they proved to be too bright for our camera. So we hunted for an internal sign, and this was what we ended up with. It’s got the name, it’s a sign, it’s on the platforms, it’ll do. This entry was posted in 4) National Rail, West Midlands on October 27, 2018 by CondorBriarpup.